Getting married this year? You only need one reason to have fireworks! Normally people write articles “10 reasons to....” or “5 ways to....”, you don’t usually see “One reason to....”, but we like to be different, so here goes. Weddings are expensive. Venues, suits, food, cars, honeymoon, flowers, shoes, dresses, shoes, dresses, dresses, why does one need so many dresses and shoes?! Anyway the costs add up and they add up fast! So everything you spend money on, you need to maximise on. However what you need to keep in mind is “what is the aim of your day?”. “Well, obviously the aim is to get married”, correct, and whatever else happens is really irrelevant as long as at the end of the day you are indeed married. For most people a wedding is the largest and most complex event they have ever had to arrange, you can’t possibly think of everything, unless of course you are a hardened event expert who has been to hundreds of weddings. Wait one minute, hardened? Yes. Event expert? Yes. Been to hundreds of weddings. Yes! That's us! We should go into wedding planning, ok maybe not, however we know what works when it comes to wedding entertainment. So you’ve read this far and you still need to know the one reason to have a fireworks display at your wedding, thanks for sticking with me here. And the reason is, because fireworks are seriously impressive! They have great synergy with weddings, you are truly madly in love with your partner and we are truly madly in love with fireworks... ermm... I mean, you are truly madly in love with your partner and a nice favour or a fancy centrepiece doesn’t really portray that, although they are all important parts of the overall event, however, you guessed it, a fireworks display does! Our clients tell us time and time again that the fireworks display at their wedding was the most talked about aspect of the wedding and well into the future. Yes, more than uncle Jimmy getting drunk and falling over! Stay with me, we are nearly there, one more point, we don’t just do fireworks, we also do pyromusicals, this is fireworks synchronised to music, so imagine the impressive nature of a fireworks display combined with your favourite song, your song, your special song that encapsulates your relationship. The music, the noise, the colour, all your guests joining in an impressive expression of your love. That is it, fireworks will be, by far, the most impressive and memorable part of your day (beside the part when you both say I DO obviously!). But don’t take our word for it, checkout the reviews on our facebook page! 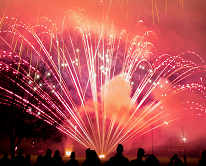 Or if you want to see whats possible have a look at our pyromusical show videos! You can now also follow us on facebook and see what previous clients have said about our shows!